Motorboat: Built in 1916 by W. F. Dunn, West Norfolk, VA; Acquired by the Navy in November 1917; Commissioned 29 November 1917; Caught fire from engine backfire and sank 27 December 1918 in Hampton Roads, VA; Struck from the Navy list 15 February 1919. Specifications: Displacement 20 t.; Length 60'; Beam 12'; Draft 3'; Speed 11.2 kts. ; Complement eight; Armament two 1-pounders; Propulsion gasoline. 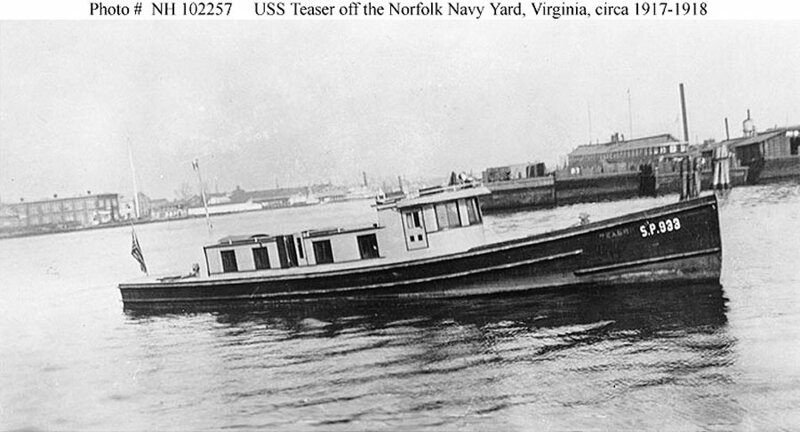 92k In the Elizabeth River, Virginia, off the Norfolk Navy Yard, circa 1917-1918.